The house includes 100 features that you won’t find in your traditional house. This may help it be one of the most sustainable* homes in Australia today. Can you use some of these ideas to ‘green’ your home and reduce your bills? 1. a 1kW Kyocera photovoltaic system, which can make the house carbon neutral – operationally (and sometimes ‘Impact Positive’ ‘ producing more energy than the house needs). 2. Low wattage lightbulbs only: No lights over 15 Watts. No wasteful halogens spot lights that spread light into corners of the house that never get used. LEDs and CFLs and fluorescent T5s only. 3. Lower wattage LCD TV, rather than a high wattage Plasma TV. 4. No energy zapping clothes dryer. 5. Standby power removed, all ‘Vampire/Phantom’ loads are negated by turning appliances off at the wall when not in use. 7. Energy efficient washing machine. 8. An ‘evacuated tube Solar Hot Water system’. A traditional home uses 28% of its power just to heat hot water. 9. Use of gas instead of electricity for stove, oven and (backup) hot water heating requirements. 10. Reticulated LPG gas removes the need for bottles on site, which reduces risk, transport (refilling) and materials (steel). 11. High efficiency Rinnai Gas Heaters (as it can get down to 0 degrees in the Valley in winter). 12. Use of recycled besser blocks. 13. Extensive use of recycled timber (eg. floor boards from an old barns and bridge timbers). 15. Use of bamboo decking from sustainably managed forests. 16. Use of a Hi-Macs benchtop (which is low-VOC, low waste and repairable, making it very long lasting). 17. Use of recycled steel (including train tracks for balcony beams, star pickets in the garden and corrugated steel sheeting in sections). 18. Use of second hand furniture, made locally and from sustainably managed and certified forests where possible. 19. Recycled spotted-gum and golden cypress timber kitchen doors. 20. Use of a second hand garage door with minor marks, but works just fine. 21. Use of only local Australian tiles, rather than imported products which harbour many more ‘transport miles’ (embodied energy). 22. Use of long lasting plastic Splashbacks called Zenolite, that are 100% recyclable; rather than high embodied energy glass. 24. Maximised solar access (because with correctly sized eaves you can make the sun work for you) ie. elongated East-West building. Shading of all internal areas to reduce heat gain in summer. 25. Energy efficient ceiling fans in all living areas . 26. A large central breezeway to maximise natural ventilation, removing the need to have fans on all summer. 27. Suspended concrete slab in living area to provide additional thermal mass i.e. for a heat bank in winter and cooling mass in summer. 28. High transmission, Low emissivity (low-e) glazing. 29. Double glazing on the (few) western windows. 30. Full length curtains and blinds to manage heat and cold. 31. Design integrated to use the large tree on the site (to provide shading from the hot western afternoon sun. 32. Roof design to ensure the photovoltaic panels are at the optimal pitch (25 degrees) and solar hot water (33-38 degrees). 33. More external (deck) space than a traditional home, as this is cheaper to build and encourages more outdoor living, where the quality of the air is greater and sun provides essential vitamin D etc. 34. Covered outdoor space to ensure all year round outdoor living is possible. 35. Inclusions to ensure a 7+ Star Energy Rating (using Accurate). This the minimum rating in much of Europe and USA. Australian States only typically mandate 5 or 6 Star and the actual homes typically only reach 3-4 star in reality once built. 36. Use of bulk insulation www.insulation.com.au/sustainability.aspx and double-sided reinforced foil insulation www.protherm.com.au to help keep the house cool in summer and warm in winter. 37. External Ventilation around the refrigerator to ensure it works optimally. 38. Externally flued gas stove top to enhance safety and remove odours completely. 39. Security screening to promote breezes and safety. 40. Use of clearstory windows to bring more light into the living pavilion and onto the strip of suspended concrete slab. 41. Use of louvre windows to maximise airflow and control. 42. Use of large ventilated skylights in bathrooms and corridor to remove the need for lights during sunlight hours and encourage natural ventilation. 43. Sensor lights in corridors and walk in robes, to improve adaptability (which is part of sustainability) ie; ease of use, reduce energy and improve safety. 44. Low and minimised lighting to adhere to the Dark Sky Policy, which minimizes glare, light trespass and light pollution, while maintaining night-time safety/security, security and does not adversely impact on night-time visual amenity. This policy also helps to reduce light pollution which disrupts the breeding cycles of insects which are vital parts of our biosphere. This includes the use of pendant lights to ensure light is applied more directly to where it is required (eg. bench tops and tables). Wall lights are also used instead of flood lights. 45. Extra wide 870mm doors to cater for wheelchair access. 46. Minimisation of stairs to enhance access i.e. ramps throughout and to each level. 47. Semi-recessed bathroom basins (to enable wheel chairs to get under them). 48. Hobless (step free) shower floors. 49. Separate and accessible Home Office. 50. Adjustable height shower heads. 52. Rounded corners on bench tops. 55. Single storey construction to reduce visual impact in the valley and the need for stairs. 56. No ‘on site council rubbish service’ this encourages residents to reduce their waste. Residents then take there waste and recycling the central ‘Reduce, Reuse Recycle’ centre. All waste food is composted on site for use in productive gardens. 58. Water efficient tap fittings. 59. Water efficient dishwasher (as on their ‘eco’ cycle, dishwashers can use much less water compared to hand washing). 60. Water and energy efficient front-loading washing machine. 61. Water tanks ‘ 45,000 litres on site – for all potable (drinking) water. 62. Gutter guard in all roof gutters to maximise on site water quality. 64. Use of Best Practice Guidelines for the ‘Control of Storm Water Pollution from Building Sites’. 65. Sediment and erosion control during construction. 66. Recycled water back to the house for use in all toilets and irrigation on plants. 67. The house is H-Shaped The house contains no electronic air conditioners, because it doesn’t need it. 68. Recycling of 80%+ of all waste materials from site during and after construction. 69. Swale drainage to minimise the need for guttering and excessive water-flow control, and to control water for even garden disbursement. 70. Native species (Australian) to reduce weed species and support local wildlife eg. native birds and bees that pollinate our fruit trees. 71. Endemic species – local to the area, to ensure drought tolerance etc. 72. Food producing species (fruit trees, herbs and vegetables) to make food available at the door, to reduce transport costs and improve human health. 73. Chickens: for local organic eggs and to fertilise the gardens. 75. Use of only water-permeable road and pathways, to allow natural drainage to occur and avoid water build-up and hence storm-water management (road gutters). 76. No lawn to minimise water usage. Lawns are available within the community on a mass scale, which is a far more sustainable and community orientated solution. 77. Use of low-VOC (volatile organic compounds) finishes eg. low VOC Paint (Rockcote, Wattyl-ID and Resene). 79. No artificial sprays or herbicides on the garden to guarantee organic food production and remove the chance of runoff polluting nearby waterways and eventually oceans (where it all ends up eventually). 80. 99% reduction in the use of PVC. We use HDPE instead for heath reasons (as the use of toxic PVC is questionable). 81. No use of CCA treated timber which contains arsenic and still exists in ‘coppers logs’ in some children’s playgrounds. 82. Non-toxic timber finishes that are water based and don’t leach toxins into the local water supply. 83. Adequately illuminated and ventilated bathrooms and bedrooms to remove the ability of toxic mould to breed. 84. The Ecovillage has laid its own fibre-optic network underground to ensure it can provide all homes with high-speed voice (phone) and data (internet) services. This provides the opportunity for people to work from home and within the community, saving transport costs and time. 85. The Ecovillage at Currumbin has developed (courtesy of the developer) its own tailor-made internal, community portal, that allows internal dialogue daily via email groups, of which there are over 40 optional sub-groups to participate in. 86. Data and coax points in every room to allow for independence. 87. ‘Star wiring’ in sections of the house to future proof it. ie; CAT5 UTP Cable to all rooms for internet and VOIP phone connections. 88. Within walking distance of 100 friendly neighbours/friends. 89. Use of bikes to get to local facilities. 90. EcoHamlet single lane roads to reduce car transport priority, making it safer for pedestrians. 92. Operable ventilation in clearstory windows to evacuate hot summer air. 93. Reduce, Reuse and Recycling principles used throughout. The Ecovillage RRR Centre will facilitate this on a much wider community scale. 94. Composting of all food scraps to reduce waste and enhance compost quality which is used to enhance food production. 95. Use of reusable bags and boxes for shopping and storage. Avoidance of non-recyclable packaging. 96. Residents give preference to purchasing locally produced produce. 97. Minimise purchase of meat products and only from organic, local, free-range, humanely raised animals. 99. 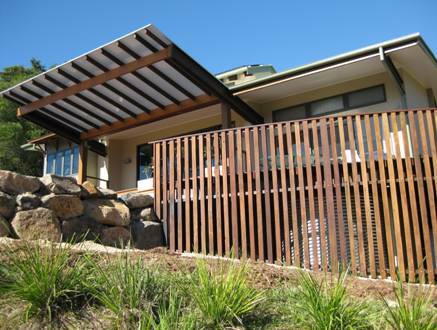 Built in the Ecovillage at Currumbin, to enhance sustainability on a local and more global scale. The Community ensures common facilities are shared which reduced embodied energy, greenhouse gases and maintenance costs eg; no individual pools allowed, everyone uses the beautiful community pool. The house also includes an intentional 15m2 of office space for local sustainable business. 100. Respect for the traditional caretakers of the land, the Kombumerri at the opening of our community meetings and through naming of our Ecohamlets. 101. No artificial fencing to remove barriers between neighbours, encourage some tolerance, and encourage natural soft planting/hedges. Even with all these features the house it not perfect, but given the scope and limits, it can demonstrate that ‘anything is possible’. Note that each house has different characteristics (climate, land conditions and occupant needs to fulfill) so each subsequent home can be based on the same principles but should not attempt to copy or include specific or prescriptive solutions just for the sake of it. The solution needs to be holistic, integrated and flexible. The Ecovillage welcomes visitors and there is an education centre on site. No dogs or cats are allowed, to protect the native wildlife, but there is an abundance of other animals on your doorstep, including dozens of resident kangaroos. 1. To be truly sustainable, a house would need to be more like an igloo, cow-hide tent or cave ‘ to be 100% recyclable, non-toxic, carbon neutral and match the earth’s live carrying capacity. We as humans have not got there yet. 2. Note also that the embodied energy in our homes today, far exceeds the use we get out of them, making them still very damaging to the environment. This is because of the steel, aluminium, concentrate, plastics and other human made products that require significant amounts of energy in production. 3. Truly carbon neutral homes produce more renewable energy than they use, at a point in time, and produce more energy than went into making the home as well. That is, operational energy and embodied component energy. Copyright Ecomplish Consulting – for additional advice contact us.